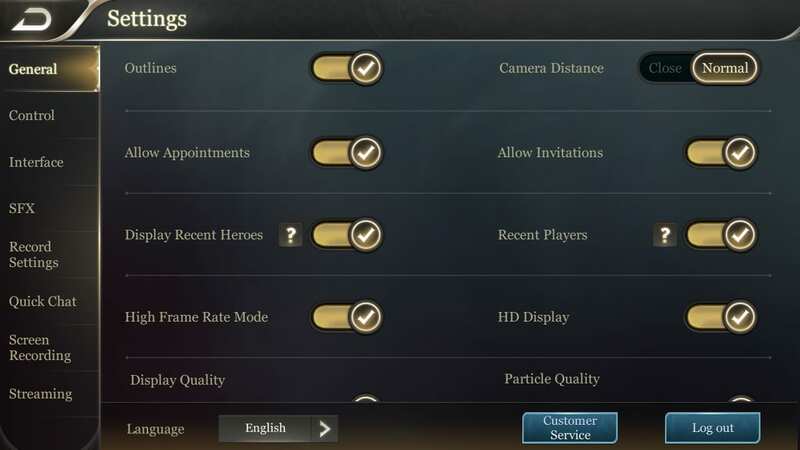 The recommended settings for Arena of Valor. Changing your settings is required in order to properly focus certain targets and streamline gameplay. The in-game screen can be customized through the settings screen, which is accessed by tapping the gear in the top right corner. 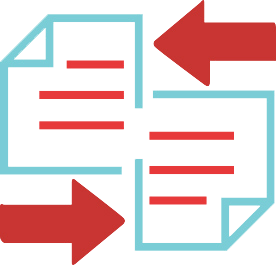 Settings for General and Control are crucial in terms of gameplay, but other settings are just for personalization. The general settings accessed from the main menu are different from that when accessed during a match. 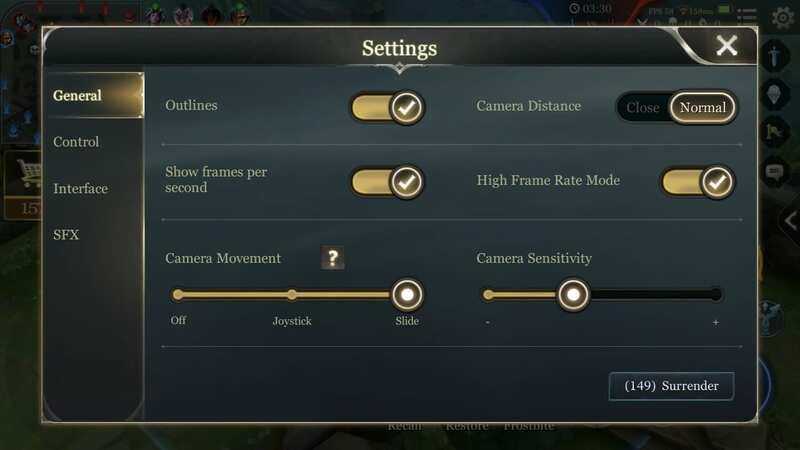 The only setting that must be changed is camera movement. This can either be changed to Joystick or Slide mode, but without camera movement, the only way to look around the map is going to be with the mini-map, which is very inefficient. Also, with Camera Sensitivity set to maximum, nearly the entire map can be viewed by sliding your right thumb in the top right quadrant of the screen. The other settings can be changed as you like. There are many controls that need to be changed for better gameplay. Attack Mode should be changed to Minions and Towers. 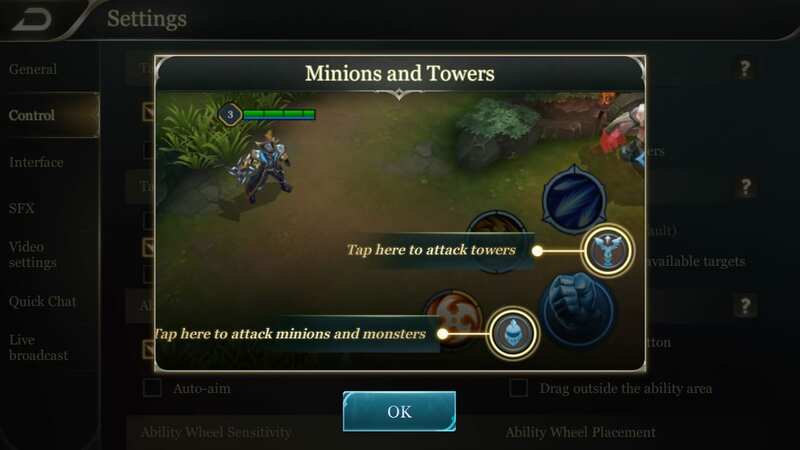 Changing this will allow you to choose between minions and towers when attacking, letting you ignore the enemy minions when attacking towers. This also comes in handy when defending a tower since you can ignore heroes and focus on the minions. When attacking monsters such as the Abyssal Dragon, you can push the minion icon to continuously attack the monster even when a hero is within the attack range. Targeting Priority needs to be changed to Lowest HP amount. 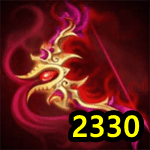 This will allow you to get more kills, since targeting the Lowest HP% might cause you to attack a hero such as a Tank that has more HP amount than the classes that have lower HP amount in total. 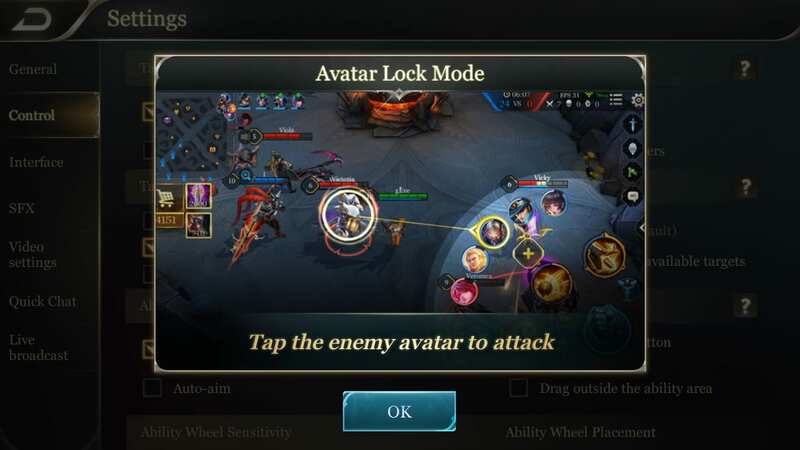 Avatar Lock Mode is very important, and it allows you to choose the hero to attack within your range. The HP is also displayed around the avatar, and there’s absolutely no need to hide the avatars. 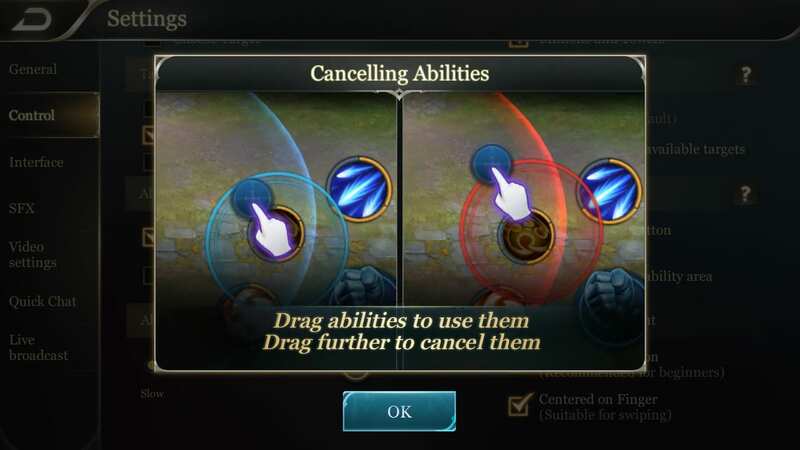 Ability Cancelling should be changed to drag outside the ability area, as it lets you cancel quicker than when using cancel button. It might take you some time to get used to, so that you don’t accidentally cancel an ability when attempting to swipe. 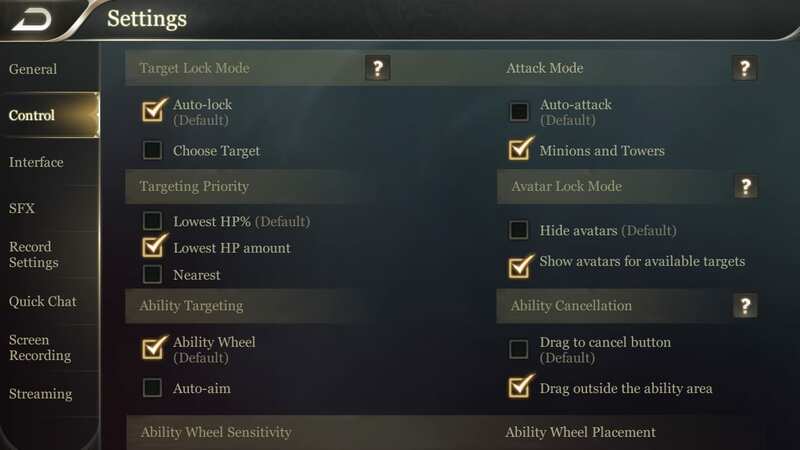 Ability Wheel Sensitivity and Ability Wheel Placement can be set to your liking. If you prefer purchasing items with your right thumb (allowing you to move at the same time), then change the Quick-Buy Placement to “Right side.” Just keep in mind that other parts of the screen will be moved around as well (game stats can be checked by tapping the scoreboard, if you were previously used to specifically tapping the list/graph icon). Expanded Mini-Map Placement is up to personal preference. 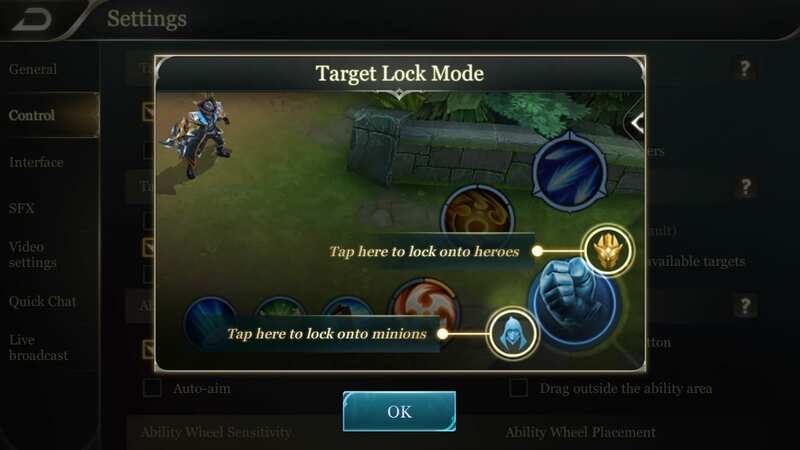 This isn’t part of Arena of Valor’s settings, but some people may be wondering how to stop annoying notifications from popping up in the middle of a game. If you’re on an iOS device, go to Settings → Do Not Disturb → Silence: Always. Then simply turn on Do Not Disturb mode before playing Arena of Valor. If you’re using Android, go to Settings → Sounds and Notifications → Do Not Disturb and change the settings there, or from Sounds and Notifications go to App Notifications → Arena of Valor and then set the app as a priority.